Horizontal and Vertical Safety Lines? 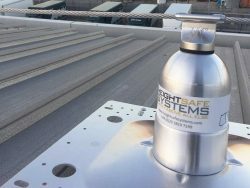 Heightsafe’s Roof Lifelines are a great solution for visually sensitive buildings that require a Fall Protection system – providing a personal measure of protection where it is not feasible to supply collective edge protection for personnel. 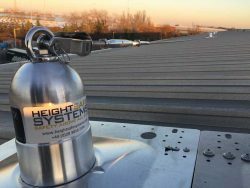 These market leading roof lifeline systems are designed to be safe and easy to use, operating horizontally, vertically, around corners, and on up-and-down inclines, offering full protection that is compliant with current legislation. Whilst complementing individual building design, Heightsafe’s flexible systems are also sensitive to planning requirements for new buildings. 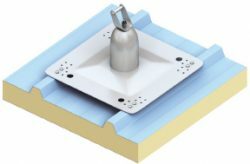 Each safety system is designed to meet specific site requirements, whether directly fixed to a solid structure, or built-up for composite metal decks, single ply membranes, concrete, or lead lined roofs. TIP: when Working at Height, it is imperative that all personnel are appropriately trained to undertake the work at hand. 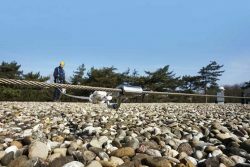 TIP: it is imperative for fall protection roof anchors to only be installed on roof applications that have a confirmed capability to support the distributed loads applied in the event of a fall. Heightsafe are available to offer pre-installation surveys. It is stated in legislation that any fall arrest or fall prevention systems used for Work at Height are tested for integrity and compliance at least once every 12 months. Specialist operatives work nationwide and are fully accredited with all of the relevant certifications to install and certify systems – with 50 years of combined industry experience and industry leading partnerships, you can be sure that your building is in safe hands when you choose to work with Heightsafe.